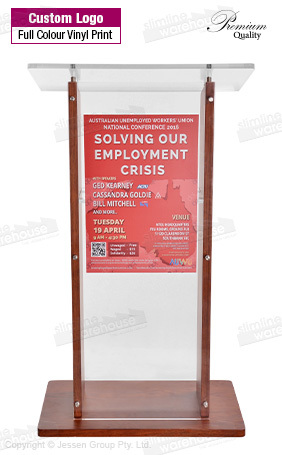 This lecture stand is a premium quality display, combining clear acrylic with beautiful wood for a truly striking appearance. The 12mm thick clear polished acrylic offers the visual appeal of glass at a lower cost, weight, and with better durability. This style of custom podium is popularly used at churches, universities, conference centres, and offices. A lecture stand, like lecterns or church pulpits, features a custom printed graphic affixed to the front of the display. This full colour CMYK poster can be up to 350 x 550mm, allowing your design team plenty of room for creating a branded graphic that will help focus an audience. 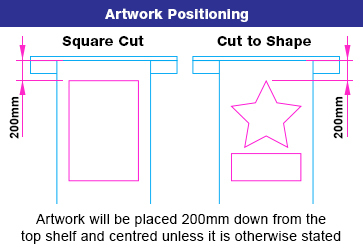 A digital printing process ensures your design comes out properly in vivid full colour. This lectern features wooden sides and base with a rich mahogany finish. The base also has rubber feet that prevents damage to floors during use. The interior shelf is perfect for placing lecture materials or a beverage out of direct sight but still easily attainable. 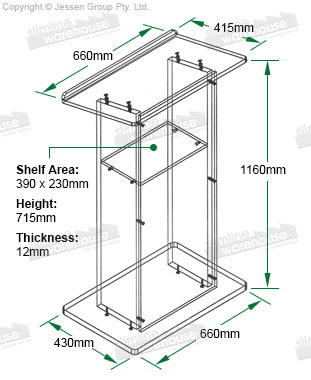 The slanted lectern top is 600 x 385mm to provide heaps of space for tablets, books, and other notes. A raised lip at the bottom ensures all materials are kept in place during a presentation. Order today in Sydney, Melbourne, Brisbane, and anywhere else Australia-wide for fast despatch from our warehouse.